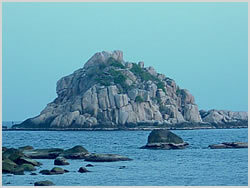 Named after its resemblance to a dorsal fin, Shark Island is a twin rock outcrop situated to the southeast of Koh Tao. Each side of the islet offers a different array of marine life and features making it almost two sites in one! On the east side you'll find myriad soft corals, gorgonians and sponges while the west offers hard coral formations that are home to moray eels, nudibranchs, sting rays and the odd Leopard shark. Titan triggerfish can be very aggressive here so approach with caution. Maximum depth at this site is 25 metres.